Please excuse my lack of knowledge, but, how would you classify a shrub/floribunda cross? 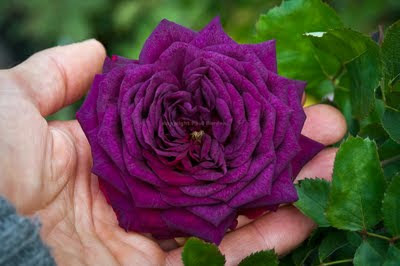 This rose appears to be magic! In this case both parents are pretty much Floribundas (a completely artificial, man-made designation to begin with) so this seedling will probably fall into that category, assuming it grows like one. The modern roses classes are rather arbitrary. As a breeder, if your selected seedling LOOKS like a Poodle, then you call it a Poodle, regardless of pedigree. Ooo, yes. Color, form and scent... sounds like a winner to me. This appears extraordinary to me. Congratulations. HI Paul, This rose and that Janet Inada look like roses that we'd be interested in using for cut flowers. VERY difficult to get good purples like that! Thanks for your interest. I doubt 'Janet Inada' will work as a cut flower because it is like most climbers: blooms mostly on very short (Ie; under 12") laterals. It also bears nasty large thorns. The purple.....well who knows. It is still too young to know what its capable of.